Our remaining position closed out at breakeven as the US Dollar rallied through out the morning European trading session and after US CPI read unchanged. It looks like our entry level was a resistance level once again as the pair has dropped back down after touching .9950. Risk aversion is still in play for global markets, especially after recent news of troubles with large US financial firms signaling more credit market concerns. Will probably continue to see US Dollar weakness, but look out for consolidation in the next few days ahead of the next Fed meeting. Stay tuned for new ideas! Our trade hit our first profit target yesterday as it reached .9850. It appears that we saw a ton of buy orders at that level as the pair rallied soon after it touched, but traders got back US Dollar selling mode. We closed a portion of our trade at .9850 and moved the stop to breakeven (.9950) to create a risk free trade. We will continue to watch the .9850 level and hold onto our position for now as US Dollar sentiment continues to be weak and commodities remain strong. Stay tuned and good luck! Our trade has been triggered after a broad US Dollar rally yesterday, but after testing previous resistance and a slew of economic events this morning (most notably the Fed lending up to $200 Billion), the pair bounced off .9900 to just back below our entry point. This injection of liquidity will support USD in the very short term, but in the long term we will probably still see a dollar decline. I will continue to hold onto this position as this rally may bring in more USD sellers to play the longer term sentiment. Welcome back to another wonderful week of Forex trading! 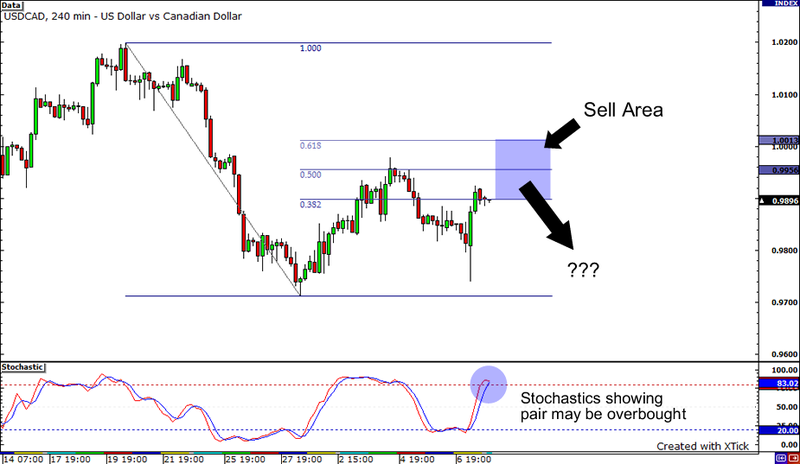 Today, we have a potential Fibonacci play on USD/CAD as the pair may resume its decline after Friday’s USD rally. On the chart, we can see the pair has rallied back to the 38% Fibonacci retracement level after Friday’s disappointing US Jobs report. Pretty weird how traders bought back the Greenback after another negative number, but the rally was probably on profit taking as USD sold off ahead of the monster report. It may be back to US Dollar selling once again as the buyers of this pair may be in short supply now. Stochastics are showing this may be the case. So, I look to short USD/CAD once again, but I will wait for the pair to reach the .9950 area (previous resistance) before pulling the trigger. Remember to never risk more than 1% of your account on any single trade. Please adjust position sizes accordingly. No major event risks until Tuesday, so we will just wait an see how the market plays out until then. Good luck my friends!